Thekkady is heaven for wildlife as well as for nature lovers and is usually combined with Munnar for a Munnar Thekkady Package which is the most popular among guests visiting Kerala. Its cool climate, scenic vistas, lush greenery and the exotic wildlife sanctuary attracts tourists from the nook and corner of the world. More of all the wonderful destinations and the blissful ambiance of Thekkady have truly made it the most favored holidaying destination in Kerala, India and there are multiple choices for Best Things to do in Thekkady. Thekkady brings the live images of elephants pack walking along the pristine lakes and rivers in Periyar wild life sanctuary and boating in the lake, spice gardens surrounded by aromatic air, chains of lush green hills, lovely waterfalls and the call of the nature giving a soothing experience & revitalizing your soul. Thekkady is the perfect place to see the wildlife animals from the very close point from the safety of the boat cruise over the scenic Periyar Lake. The major attraction of Thekkady is the herds of elephants that walk along the edge of the Lake sprinkling water all over. In addition to the boating in Thekkady there are lot of other Things to do in Thekkady as well. The first and foremost activity of a tourist visiting Thekkady is Boating in the Lake. One can see the wild animals along the gringe of the lake foraging, bathing, drinking and resting. It would be a greater fun if one is lucky enough to see the elephants playing with their babies in the lake. KTDC and Forest Departments are operating the Boat Service. Daily 5 Trips and each trips of Two Hours. Jungle Patrol or Shepherding the jungle is one of the Best Things to do in Thekkady. This programme is part of the regular night patrolling in the fringe eco-development zones of the tiger reserve. By participating in this, one is actually helping in the protection of the forests of Periyar. The trekking could be at any time between 7 p.m and 4 am. and could be taken by persons having proper physical and mental fitness to trek through the wilderness in the night. The maximum duration for a slot is 3 hours and maximum capacity of one slot is limited to 8 visitors (to move in two separate teams). They will accompany two protection watchers and one armed forest guard! Try the limits of your senses-sight, hearing and smell and take in the totally different world of nocturnal jungle life. This is a conservation oriented hard trek taking up a full day. The Trekking starts at 8’o clock in the morning and ends in the evening. The route passes through undulating terrains. Attitudinal ranges of 900 meters to 1300 meters will be covered in the trekkers could glimpse the lofty escarpments bordering the park watershed and the vast plains down below. Gaur, sloth bear, elephant, etc. are often sighted along this route apart from birds and butterflies. Maximum of 10 Tourist can hike the programme in two different groups. The Trekkers will go with two guides and an armed forest guard. Vegetarian refreshments can be had en route. Bamboo rafting in thekkady is a dawn to dusk range hiking and rafting programme through some of the richest forest tracts of Periyar Tiger Reserve including the thick forests on trek and then to the catchments area of the Periyar Tiger Reserve on a bamboo raft is popular among the Best Things to do in Thekkady. Starting at 8 am from the boat landing, a mosaic of habitats will be traversed before the party gets in to rafts made of bamboos. The forests are rich in bird life and arboreal animals like giant squirrel and Nilgiri langur. The rafting is for about three hours and one gets a panoramic view of forest – clad hills reflected on the lake. Animals like elephant, gaur and sambar are sighted keeping close to the edges of the lake. The team hitchhikes back to the boat landing by about 5 pm. An armed guard and 4 guides will accompany a maximum of 10 tourists. Tea, snacks and packed lunch will be served en route. This eco friendly program takes the tourists to . Bamboo rafting program normally starts at 8 and ends by 5 in the evening. Lunch and tea are served during the day. A Tribal heritage museum built inside the Mannan settlement featuring various types of artifacts related to their ancient agricultural practices, marriage ceremonies, cultural events, dress code, rituals and death ceremonies is the hub of this ecotourism programme. Display of fishing gear, hunting weaponry, indigenous medicine and vessels, cereals, medicinal herbs, bamboo furniture etc. are other attractions providing a peep into their original culture.Tribal Heritage Visit is a two hour programme available on all days from 8 am. to 12 noon and 2 pm. to 4 pm. It involves mainly the tribal museum visit and trekking through the tribal hamlet situated within the periphery of Periyar Tiger accompanies by a tribal guide. Conducted by a group of people who were engaged in sandal wood smuggling, later surrendered before the Forest Department. This programme is a visit in a bullock cart to the farming areas of diverse agricultural crops of mangoes, tamarind, onions, sunflower, jasmine and a score of other vegetables. The profit from this programme goes to rehabilitate this group of people. The programme starts at 6 am. In the morning and 2:30 pm in the afternoon and is a 3 hours package. Border Hiking is a trekking program conducted on the high terrains of the forests ranging to heights of 1000 to 1200 meters. A group consist of 13 people comprising of 10 tourists, 2 guides and 1 armed guard. About 4000 Sq. KM of Idukki district is under verdant spice plantations. The main occupations of the natives are spice farming and trading. The original produce was cardamom, pepper, ginger and turmeric, cinnamon, nutmeg, cloves, all spice, tea etc. This will give an excellent opportunity to the visitor to see the spice plants and ayurvedic medicinal plants and buy some garden fresh spices from the plantations. This Tour will take 2-3 hours. Periyar Tiger Trail is a unique program launched by the forest department to provide a unique opportunity for visitors to explore the wildlife deep into the forest. This program is conducted by the erstwhile poachers who are reformed themselves as saviors of forests. These people possess exceptional knowledge about the terrain and wildlife. The team comprises of 5 tourists, 5 guides and 2 forest department officials. There are two types of programs offered, such as 1 night and 2 days or 2 nights and 3 days covering a distance of around 35 km. Team members trek along the forest during the day time and stay inside the tents at nights. Food is cooked in the forest using vegetables and fruits available in the jungle. This program provides great opportunity to encounter wild animals such as giant suirrels, elephants, sambars, sometimes even tigers. Chellarkovil Waterfalls are 15 km north to Thekkady and Kumili at Anakkara panchayath. The Kerala State Forest Department has implemented community based ecotourism activities like valley view from wooden watchtower; border trekking, spice and ayurvedic garden visits.The cascading waterfalls are feast for the eyes. The village slopes down to the farms in neighbouring Tamil Nadu.Chellarkovil is the perfect place for trekking and for other adventure activities. Enjoy the wind, sunset and plains of Tamil Nadu and trek through the rocks at Ramakkalmedu which is a hill station and a hamlet. The wind gusts into the hills and recorded as maximum in Asia. Wind blows at a speed around 35 km per hour at Ramakkalmedu throughout the year irrespective of the season and time. The hilltop also offers a panoramic view of Tamil Nadu towns of Cumbum, Theni, Kombe, Thevaram, Uthamapalayam, Bodinaykannor and Vaiga.It is believed that that lord ‘Sree Rama’, had set his foot on this rock and hence the name Rama-Kal-Medu (Meaning: Rama’s foot imprints). One story says that Lord Rama kept his feet at the tip of Ramakkalmedu to search Ravana the King of Lanka who abducted his wife Sita. The Kalvari Mount mountain provides beautiful views of the Idukki Reservoir as well as the two prominent tribal villages of the region, namely Kamakshy and Mariyapuram. Elephants can also be seen roaming in the forests, near the foothill.The Malankara Dam, Idukki Hydroelectric Project and Nadukani and numerous tea gardens are present in its vicinity and this mount is on the way to Kattappana. 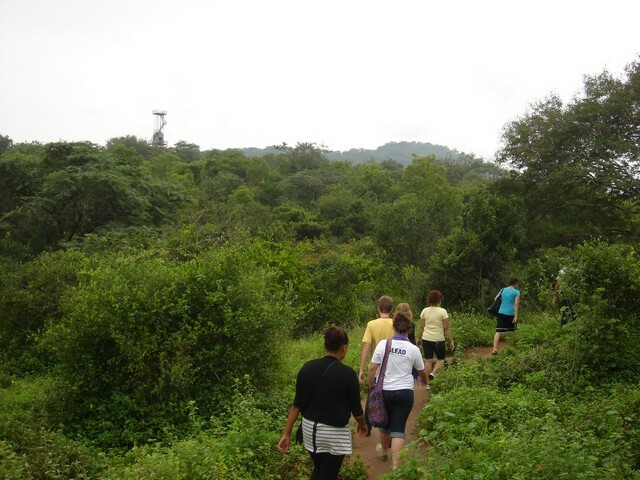 Nature walk provides excellent opportunity to explore the nature in its own turf. Normally, nature walk routes pass through forests and grasslands providing unique experience of watching rare birds and other small wildlife. Nature walk programs are conducted by forest department between 7.30 to 11 am and 2.30 to 3.30 pm usually, a batch consisting of maximum five people with a well trained guide go into jungles for nature walk. As the guide is always a local inhabitant of forests, they are well versed with the jungle routes and wildlife behavior. 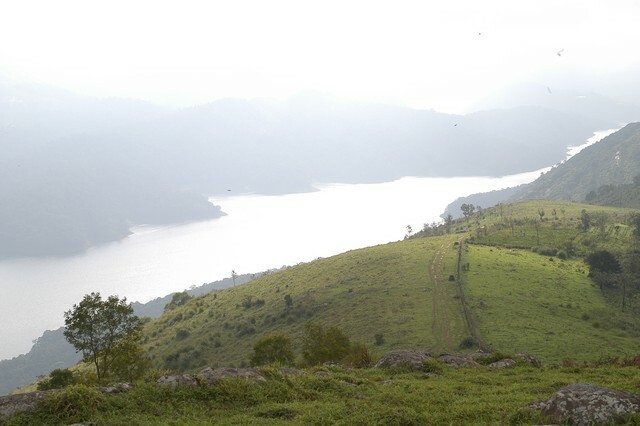 Thekkady has different nature trails traversing diverse habitats from the trekking routes, generally to 4 to 5 km. in length. This is an interpretive programme offering excellent opportunity to watch birds, butterflies and other wildlife, flaura and fauna. The trails often pass thourgh evergreen and moist deciduous forests interspersed with marshy grasslands. The programme is offered between 7:00 am. And 10:30 am. and between 2:00 pm. And 3:00 pm. and lasts for about 3 hours. A maximum of 5 persons can go for trekking at a time along each nature trail, accompanied by a trained tribal guide. The Nature walk is the right programme to feel nature, hear her whispers and smell flowers. Thekkady also has other attractions like treehouses in Thekkady Trekking to Gavi, Kathakali SHows and and Kalarippayattu Shows as well.